The six astronauts set to ride the space shuttle Endeavour on its last voyage to space ran through a mock launch countdown today (April 1) for practice. 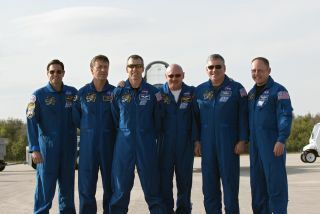 Endeavour is set to lift off on its final STS-134 mission April 19. It will carry a large astrophysics experiment and a load of spare supplies to the International Space Station. "My crew and I will get to strap in," Endeavour commander Mark Kelly told reporters after arriving in Florida Monday (March 29). "We practice the launch countdown that day and I know these guys are excited to do this. TCDT, or the terminal countdown demonstration test, is when the processing and the training kind of comes together." Kelly and the STS-134 crew are at NASA's Kennedy Space Center in Cape Canaveral, Fla., where Endeavour stands ready at Launch Pad 39A for its last blastoff. "We like coming in to see the space shuttle," Kelly said. "It's always exciting, especially when you're three weeks away from launch." Today's countdown test was delayed from its scheduled start this morning by storms with strong winds, rain and lightning that kept teams off the launch pad. The rehearsal finally began at 2 p.m. EDT. In addition to managing the hectic shuttle training schedule, Kelly has been supporting his wife, Congresswoman Gabrielle Giffords, through the difficult process of recovering from a gunshot wound to the head. Giffords, D-Ariz., was shot outside a Tucson grocery store in January during a community outreach event. "We're still working on plans," Kelly said. "We don't have final approval from her doctors yet, but we are pretty hopeful that she may be able to get down here."